The AAA Scholarship Foundation does so much more than provide economic assistance to low-income families. They give children, like Sofia Tabaniag, a chance. A chance to challenge themselves academically and a chance to flourish as both a student and as an individual. This scholarship gives children the chance to push themselves to do the best they possibly can, in all aspects of life. Now in the 3rd grade, and attending Calvary Chapel Christian School, Sofia has surpassed every expectation and hope her mother Iandell could have ever wished for – which was all made possible by the people and donors that work tirelessly to make this program possible. Iandell Tabaniag grew up in Hawaii and attended a local public school alongside her siblings. While she received a proper education, she wished more scholarship opportunities were available to give her expanded educational options. When Iandell became a mother herself, one of her main priorities was to give her daughter, Sofia, the best education she could. Unfortunately, this meant Iandell would need to make some sacrifices. Hawaii would always be home to Iandell and her family, however there weren’t as many affordable school opportunities that she felt would be a good fit for her daughter. Iandell has family that lives in Nevada, and after many months of researching and seeking advice from her relatives, she made the bold decision to pack up and move across the country. Iandell’s husband found work as a supply clerk for a medical facility, while she began serving as a teacher’s aide. However, they found out after moving that the Las Vegas public school Kindergarten programs offered were only part time and the quality of education their daughter would receive would not be the best. 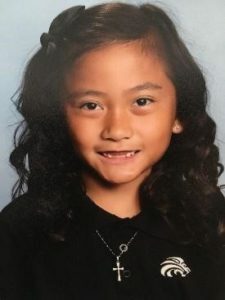 Iandell received a recommendation about a private Kindergarten program that they believed Sofia would thrive in at Calvary Chapel Christian School. When Iandell and Sofia visited the school, they were blown away by how welcoming the staff was to them. Instructors were passionate about teaching and wanted their students to work together and rely on one another to make an impact on the world. The cost was much higher than Iandell and her husband had anticipated, but they worked tirelessly to make it work – making financial sacrifices and working with the private school to pay in installments to help keep up with the rest of their bills. The move alone was a challenge, but adding in other factors, such as Sofia’s education, was taking a toll on the Tabaniag family financially. Even with two incomes, their family was struggling to make ends meet. As first grade was quickly approaching, Iandell needed options. She considered other options, including the local public school program, and while she was not opposed to it, she knew this would be one of the many hurdles her family would face. Even at a young age, Sofia demonstrated promising potential and Iandell felt that the only way this would continue would be to find a setting where she wouldn’t fall behind in a crowd of students. The Kindergarten program that Sofia was attending had informed Iandell about AAA Scholarship Foundation. Because her family met the household income requirements, she applied for a scholarship and was more than relieved to hear that they qualified. Iandell’s hopes and dreams for her daughter were slowly becoming a reality. Fast-forward three years and Sofia is doing better than Iandell could have ever imagined. Not only has she found her “home away from home,” but she is being challenged academically in a healthy way. Now in the third grade, Sofia is learning and studying above grade level – while also maintaining A’s! She has improved in many subjects, including writing, reading comprehension and spelling. This year she has even learned cursive! The school pushes their students to step out of their comfort zones. For instance, the students are required to participate in a public speaking program called Speech Meet which helps teach them important skills that they will continue to use for the rest of their lives. Sofia has competed in her class, won first place, and will be competing in the District Speech Meet with other private school winners. The school also values the arts and participates in an art festival, in which Sofia’s artwork was recently chosen to compete among the other private school entrants. Because of the relationships Sofia has already built with her former teachers, she looks forward to moving up grade levels and meeting new teachers. Sofia has a true passion to learn, and Iandell knows this opportunity wouldn’t have been possible without help from the AAA Scholarship Foundation.